As patients of Dr. Nelson, your trusted family dentist in Salmon Creek, know firsthand, periodontal disease has long been linked as the leading cause of tooth loss in adults. However, growing research has shown that the damage caused by advanced gum disease isn’t limited to only the mouth. Gum disease has also been linked to an increased risk of a variety of serious degenerative diseases. Like our stomach, the mouth contains a complex ecosystem of bacteria health experts refer to as the oral microbiome. Just like in the stomach, different strands of bacteria compete for space. When all the different types find a balance, the gums remain protected from bacteria that causes oral disease. However, altering this delicate balance provides an opportunity for pathogens to invade, causing periodontal disease, which only further distorts this balance. Pathogenic bacteria causes periodontal disease to develop; however, they’re not the only primary suspect. Previously, researchers used to believe that bacteria destroys tissue, but today researchers now know that inflammation caused by bacteria is actually what destroys oral tissue. In other terms, the bacteria that causes disease triggers a response from the body’s immune system, and the summoned white blood cells not only eradicate the harmful bacteria but also damage gum tissue. The impact of advanced gum disease can range from minor redness and swelling of the gums – a condition referred to as gingivitis – to the total destruction of the bone structure that supports the position of your teeth – advanced periodontitis -, which is responsible for tooth loss. Over the years, patients suffering from periodontal disease have been found to have a higher risk of developing a range of chronic health conditions that include dementia, complications with pregnancy, chronic respiratory disease, diabetes, and heart disease. While researchers don’t currently know if periodontal disease directly causes these types of health problems to develop, or if people with chronic health issues just have a harder time caring for their oral health, there’s no denying the association even if a cause and effect relationship hasn’t been established. Furthermore, the association probably works in both directions. Research into diabetes, for example, has shown that successfully treating gum disease reduces the severity of diabetes and vice versa. The following tips will greatly help to reduce your risk of gum inflammation or gum disease. Brush and floss daily. Brushing your teeth at least twice a day and flossing before bedtime will help to remove harmful bacteria from the mouth and balance your oral microbiome. If you have wide spaces between your teeth, implants, or dental bridges, you may want to consider the use of a water pick to help thoroughly clean between the hard to reach areas of your teeth. Don’t Smoke. Patients who smoke up to a pack and a half of cigarettes a day are three times more likely to develop periodontitis when compared to nonsmokers. Those who smoke more than half a pack a day have six times the risk. Eat a balanced diet. A diet loaded with fatty fish, nuts, legumes, fruits, vegetables, and vegetable oils not only offers all the essential nutrients your body needs, they also help to prevent inflammation. There is some evidence that individuals whose diets are high in omega-3 fatty acids, found most commonly in fatty fish, have a lower risk for gum disease. 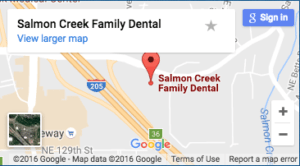 Schedule regular checkups with your family dentist in Salmon Creek. Dr. Nelson and our staff can remove harmful oral bacteria and spot the initial signs of gum disease. So don’t delay in scheduling your next dental appointment with our staff at Salmon Creek Family Dental.